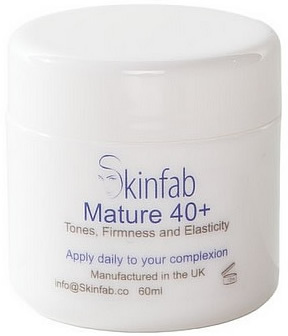 Mature 40+ is clinically proven to improve the various manifestations associated with skin aging in mature skin, Mature 40+™ visibly reduces the appearance of fine lines, wrinkles, sun spots, large pores and skin redness, increases the skin’s natural moisture content and barrier function, and enhances skin’s overall firmness, tone and elasticity, while restoring the skin’s overall texture. Teprenone: In a clinical study Teprenone was used at 3% concentration with a panel of 24 volunteers with an average age of 58. It was said to show a significant and visible activity on both functional and structural signs of ageing. Skin functions were improved, with increased hydration and reinforcement of barrier function (the protective upper-most layer of skin). Pigmented spots were reduced by 56% after six months. Also, skin recovered its structure with +35% firmness and +45% tone in just one month, with isotropy increased and roughness decreased. Lines, wrinkles and erythrosis (reddish tinge to the skin) were also said to be reduced. Subliskin: A plant derived active that improves thin and fragile skin, increases hydration levels, and increases the elasticity of the skin, leading to a smoother, softer, and fuller complexion. Hyaluronic Acid: Retains water like a sponge, absorbing more than 1000 times its weight. This helps to attract and maintain water within the skin space, hydrating your skin and increasing its volume and density. Hyaluronic acid is also involved with the transport of essential nutrients to the skin's viable cells. Hyaluronic acid provides volume, helping to contribute to the skin's overall appearance.